All-Star blogger and All-Pro football player, Chris Cooley showed his junk and Playing the Field captured the original photos. Some were worried about his showing of the Redskins’ playbook, but his subtle displayig of his package was the only real part of the photo. The playbook page was a fake. Ed Hachuli blew a controversial call in the Chargers/Broncos game, which the Bronco eventually won. Sports by Brooks is calling-out Ed “Guns” Hachuli for blowing the call, that was a fumble, but ruled an incomplete pass on the field. Norv Turned showed a little backbone and was pissed off after the game. The Broncos showed cajones by going for it all on a list minute 2 point conversion. 39-28 Broncos, was the final. Cutler and Rivers showed the league that they’re becoming the class of the league for those QB’s not named Peyton or Tom. 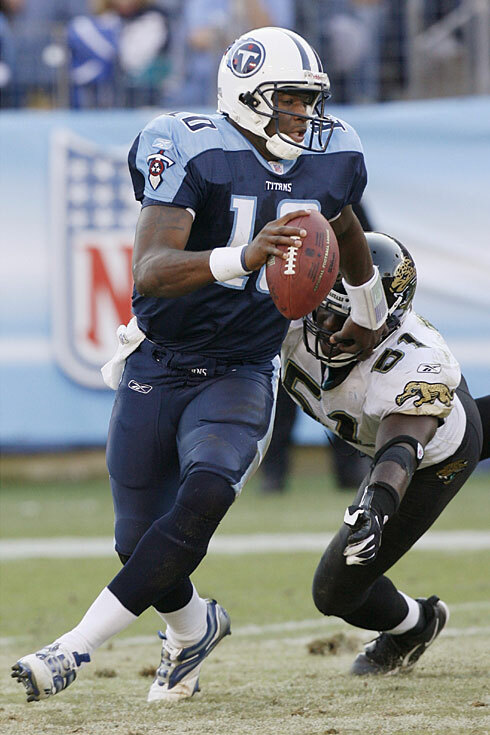 Vince Young, Where Have you Gone? Fischer, Young, and the Police met at a park in Nashville, and everything turned out okay. This is crazy-talk. Vince Young is one of the up and coming QBs in the game, atleast we thought so. Vince won the Rose Bowl singlehandedly in one of the most memorable college football games ever. 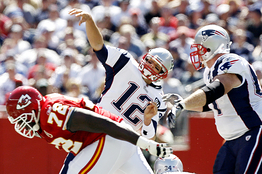 Many have questioned his ability to throw from the pocket, but no one has questioned his leadership. We hope that this is merely a one-time deal, and that his friends over-reacted. But if it’s not, then Vince is in a different world that we thought. Fantasy owners are feeling the effects of the Brady injury. Last year, Brady sent NFL records like they were going out of style, and won fantasy owners who drafted him, 50% of their leagues. SportsBuff.com is totaling that there are $500 million dollars on the line in fantasy pools this year. This year, he was projected to win 30% of the fantasy pools, by owners who drafted him. That means $150 million dollars changed hands as a result of his busted knee. I didn’t draft him, but I know guys who did. They are fired-up, but we recommended drafting Jay Cutler as your back-up. If you followed our advice, you’re good. For the gamblers, Vegas also stared the season with the Pats having the best odds to win the Super Bowl, at 7:2. Now the Sports Line at the Wynne Hotel has changed the Pats to 10:1 to win the big game. The Steelers, Chargers and Cowboys now have better odds to win the Super Bowl, while the Colts are also 10:1. Mike Silver from Yahoo Sports is reporting that Brady is out for the year. Click here, to read his article. Below is the video from the injury. On NBC’s Football Night, Bob Costas treated the injury as if it was Russia invading Georgia, on the scale of importance. Since the Colts lost, and ruined a death pool team of mine, and the Chargers too, whose the favorite for the AFC? Sorry LaRon. You’re a horse who normally lays the wood on lanky receivers, but in the Giants/Skins game, you were served. Chad Johnson is no more, he has re-invented himself, and his new last name is “Ocho Cinco.” The Ticket, ESPN Radio 790 in Miami, reports that Chad officially changed his last name. Luke expressed his disdain for ESPN in covering the soap opera of “Ocho Cinco.” Really, we’re all sick of this stuff. We believe that Chad needs to update us once a week, and quit wasting NFL fans time with all these dramatics. 24 Hour Sports News Networks are feeding this mess of mass sports marketing and shoving Chad Johnson down our collective throats. However, Chad changing his name to Ocho Cinco, now that’s a novel idea. Maybe he’ll claim Latin America as his native land. This is a great career move, and now let’s not here from Mr. Ocho Cinco until next Friday. Thus far the Cincinnati Bengals haven’t updated their media guide to reflect Chad’s new surname, but we’ll keep you posted if this story is legit.